Rajan Kumar is the lead for the team developing new stretchable battery technologies. 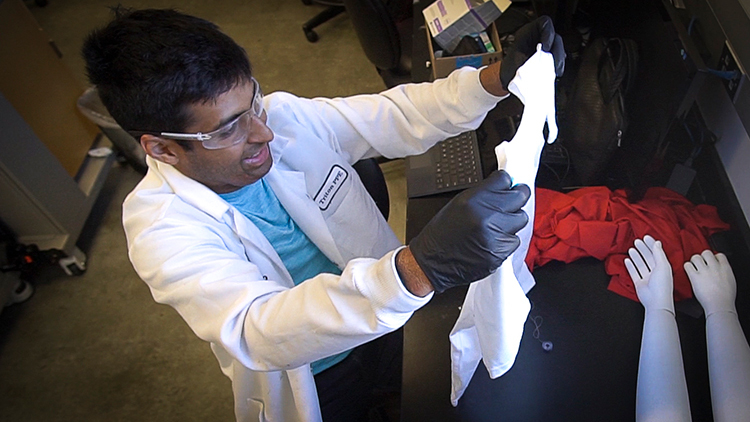 Kumar is a nanoengineering PhD student at the UC San Diego Jacobs School of Engineering. San Diego, Calif., May 23, 2017 – Today the Institute for the Global Entrepreneur (IGE) at the University of California San Diego announced team selections for its new technology accelerator. Five UC San Diego research teams, with innovations ranging from advanced healthcare diagnostics and medical device technologies to next generation LIDAR for autonomous-vehicle navigation, have been selected to join the new campus program. Founded by the Institute for the Global Entrepreneur, a collaboration between the Jacobs School of Engineering and the Rady School of Management, the IGE Technology Accelerator provides each team up to $50,000 in financial support over the year-long program, with a particular focus on helping teams validate their technologies and business models by field testing their prototypes with strategic partners. The accelerator also provides entrepreneurship training, business and technical mentoring, industry connections, and access to research and prototyping facilities. “At the Institute for the Global Entrepreneur, we are focused on unlocking the potential of the numerous innovations we generate at UC San Diego,” said Sujit Dey, director of the Institute for the Global Entrepreneur and a professor of Electrical and Computer Engineering at the UC San Diego Jacobs School of Engineering. “There are many research projects on campus that have tremendous market potential, but successful commercialization requires strategy, planning, organization and support. We are excited to be providing our first group of talented and promising teams in the technology accelerator with these resources. Ensuring that teams successfully perform strategic field testing of their prototypes, potentially with a future customer, is one of the unique aspects of this technology accelerator,” said Dey. The milestone-based program offers funding for developing, fine tuning, and testing prototypes with actual users. Each team works with a team of dedicated mentors from a pool of seasoned entrepreneurs and relevant technical experts. In addition, each team receives $25,000 in expertise and facilities access at UC San Diego’s Qualcomm Institute to its Nano3 cleanroom labs and its world-class Prototyping Facility, with other QI services subject to availability. Because timing often makes the difference between success and failure, the IGE Technology Accelerator aims to reduce the time it takes each team to get their first customer. The IGE Technology Accelerator program is one of a series of new and ongoing innovation and entrepreneurship initiatives that received support from the Office of the Chancellor and from California Assembly Bill 2664, which provided $2.2 million for each UC campus to expand innovation and entrepreneurship activities. Funding for the IGE Technology Accelerator was generously matched by a gift from The Legler Benbough Foundation. “We see technology accelerators like IGE’s that recognize new innovation and promote the development of new enterprise, as a major economic driver for the future of San Diego,” said Peter K. Ellsworth, president of The Legler Benbough Foundation. Conformal electronics is an emerging class of devices that can conform to complex non-planar and deformable surfaces. The team is developing printable, stretchable, nanoparticle-based materials for batteries using safe, high-performance chemistries. The VeoCor team has developed the first personalized tool to assess the risk of cardiac thrombus (blood clot) formation and associated stroke. The project aims to prevent thousands of strokes per year by deploying its diagnostic technology clinically to enable evidence-based treatment decisions in patients with heart failure and heart attacks. VeoCor’s patented technology analyzes standard ultrasound images to provide a quantitative measure of blood flow within the left ventricle, identifying areas of stasis which are most susceptible to thrombus formation. The team is developing specialized nanoparticle-based coatings to enable the use of standard medical instruments in Magnetic Resonance Imaging (MRI) assisted medical procedures. Departments: Mechanical and Aerospace Engineering Department at the UC San Diego Jacobs School of Engineering; the Division of Pediatric Cardiology in the Department of Pediatrics in the UC San Diego School of Medicine; Rady Children’s Hospital San Diego.